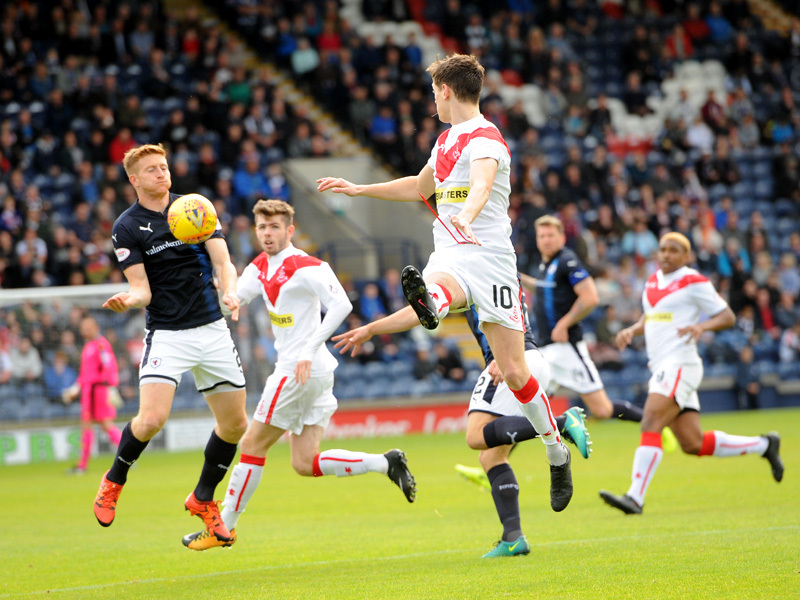 Raith left it late but continued their winning run, with two second half goals earning three points against a spirited and skilful Airdrie side. 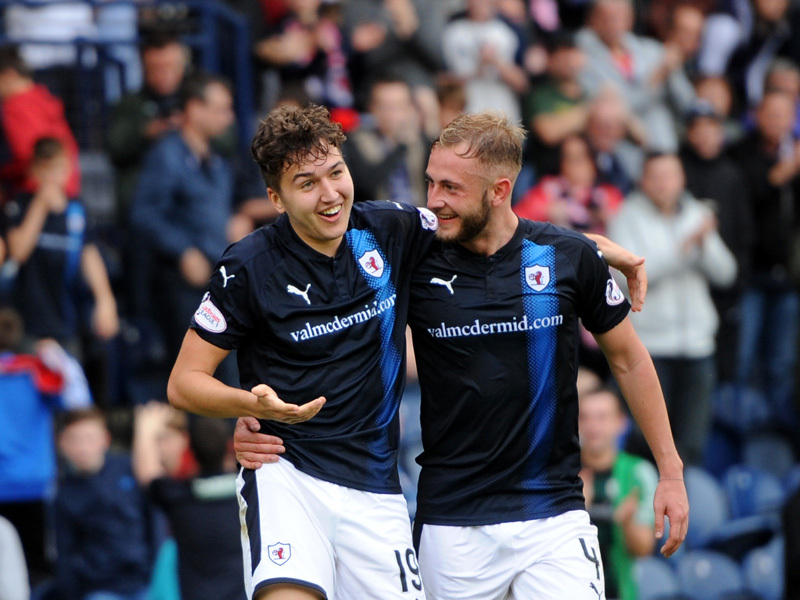 Second half strikes from Jason Thomson and substitute Dario Zanatta gave Raith the win, keeping the Rovers six points clear at the top of the League table. 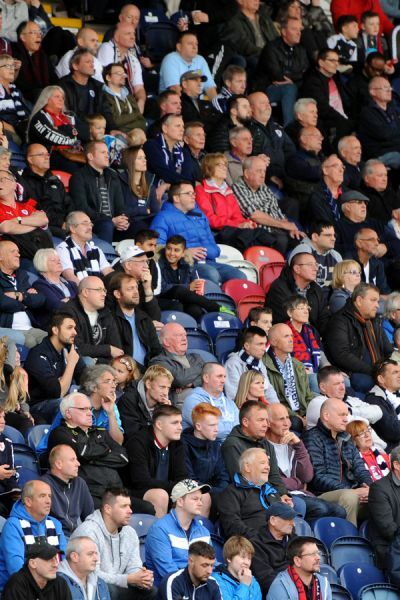 After an even first half, in which both sides created chances and played attractive attacking football, Raith’s self-assurance flowing from five consecutive League victories paid dividends, capitalising on numerous late openings to take the spoils and retain top spot. Perhaps unsurprisingly for a team in winning form, manager Barry Smith kept an unchanged starting eleven and subs’ bench. 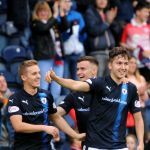 Goal-scoring substitute from a week ago Dario Zanatta remained on the bench, Robertson and Davidson started again as the central defensive partnership, and the League’s top-scoring attack of Spence, Vaughan, and Buchanan looked poised from the off. 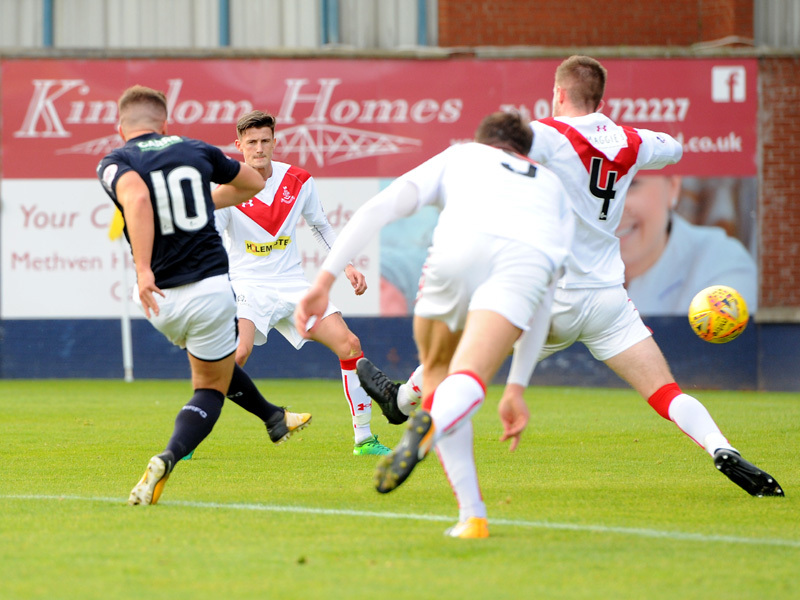 Once familiar visitors to Starks Park, Airdrie have struggled this season. 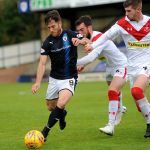 Still without a manager following Mark Wilson’s departure in the summer, the Diamonds only have two wins thus far. 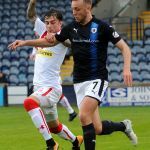 Two recent defeats to East Fife and Stranraer had followed two encouraging wins over local rivals Albion Rovers and Alloa – consistency has been a struggle. 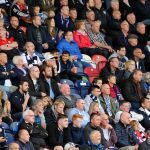 With former Rover Gordon Dalziel instructed to review footballing operations from top to bottom, Airdrie visited Starks Park in a state of flux. 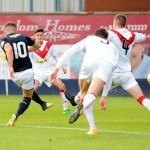 The starting eleven saw three changes – full-back Sean McIntosh, forward Cameron Russell, and youngster Dean Cairns all promoted from the bench, replacing the suspended striker Jake Hastie, injured Ryan Conroy, and highly-rated youngster Ryan Tierney. 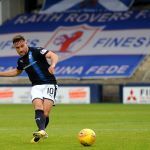 Club captain Marc Fitzpatrick remained side-lined with a serious knee-injury, but having expressed an interest in take the Head Coach’s job on a full-time basis, led his side from the touch-lines here. The visitors began in a 4-5-1 formation, with the muscular Furtado left to plough a lone furrow, Cairns and Fry briefed to support. 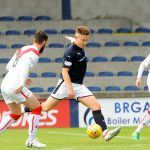 Despite the numerical disadvantage, the burly young striker showed no respect for his more senior counterparts – bullying his way past Robertson to fire at Smith in the third minute; the Raith keeper got his angles right, saving well. In defensive possession, Airdrie’s wide midfielders Russell and Stewart pushed right up on Thomson and Murray, the high-line creating space in midfield. Airdrie clearly had a plan. 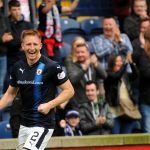 Eight minutes were on the clock when Raith burst forward for the first time – Herron’s high ball dropped to Murray feeding off Spence’s header, the defender’s shot well saved by Ferguson. Spence’s lovely inside ball invited Vaughan to skip past his man and slip Buchanan in – his shot drifted wide just as the linesman raised his flag. In Willis Furtado, Airdrie have a figurehead who will trouble defences all season. Having arrived from France, the youngster scored seven for Stenhousemuir last season. He worked keeper Graeme Smith with shots off both left and right feet, beating Davidson and Robertson for pace. 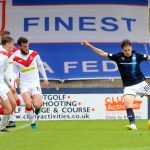 For Raith, Vaughan whacked the inside of Ferguson’s post from 18 yards, and Spence was inches away from a Buchanan cut-back. 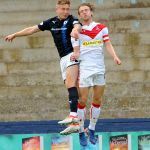 Following Herron’s cross-field ball, Thomson nodded inside for Vaughan, the youngster going down under contact from the impressive Airdrie full-back MacDonald – referee Northcroft booked the Raith man for simulation. Both sides traded blows as the first half progressed. 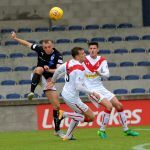 Thomson and Herron worked the ball out from the right-back area, before Buchanan and Barr exchanged a lovely one-two, the former Livingston man racing into space behind his full-back – Ferguson clutched the cross in front of Spence. Buchanan was narrowly flagged off-side moments later, again haring beyond Airdrie’s defensive line. 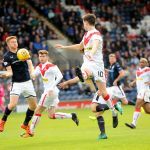 Watt’s free-kick into the defensive wall and another firmly-struck drive from Furtado showed Airdrie had weathered a minor Raith storm. Watt showed great technique soon after, volleying a rising ball just over Smith’s bar. 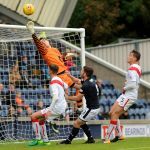 Fry’s bouncing shot forced the Raith keeper into another save. The home side’s frustration showed, Thomson scything into Russell on the near touch-line, fortunate to avoid a caution. Both sides had earned their half-time cup of tea, yet neither deserved to be behind. While there had been chances at both ends, the contrast in styles was clear – Furtado took the fight directly to both Robertson and Davidson, winning aerial challenges and barging into tackles; for Rovers, the celebrated triumvirate of Spence Vaughan and Buchanan stood off, exchanges passes, and looked for space in behind. The only surprise at the break was the nil-nil score-line. A fair assessment would have been that the game could yet go either way. 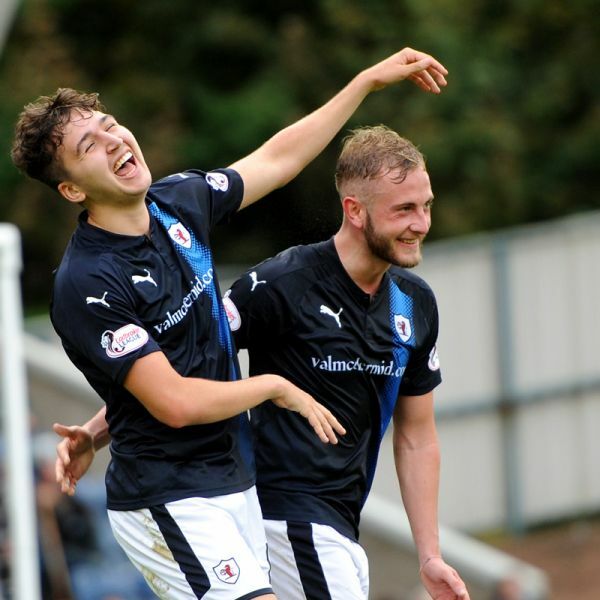 Raith came out firing. Vaughan ran at McIntosh; on the other wing, Spence burst past MacDonald. Two corners came in the opening moments. Both Herron and Murray pressed forward, drawing midfielders, creating room for their forwards to exploit. On the break, the visitors reminded their hosts that they posed a threat – Furtado was denied by a great save from Smith, racing onto Robertson’s short back-pass; Russell flicked wide from a deflected high-ball. McIntosh raced over half-way, allowed Stewart to find Fry, and the midfielder’s bouncing cross-shot narrowly missed Smith’s far-post. Ten minutes in, and the second-half was following the first – both sides attacking with pace and some neat passing, with chances at both ends. 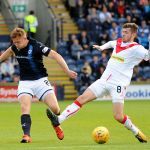 If anything, Raith were attacking with slightly longer deliveries in the second half – both Davidson and Robertson looked long to find a striker in space. Several deeper passes found an Airdrie head or the touch-line, to the dismay of the South Stand. 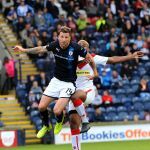 With Spence substituted for Zanatta, Raith added more weight to the front-line. Within minutes, Davidson’s looping header was clawed away by Ferguson, and Buchanan was narrowly flagged off-side with a clear run in on goal. The crowd held its breath as Herron’s flashing volley fizzed just wide. Having won possession in midfield, Vaughan drove forward, Buchanan again lashing just beyond the near-post. 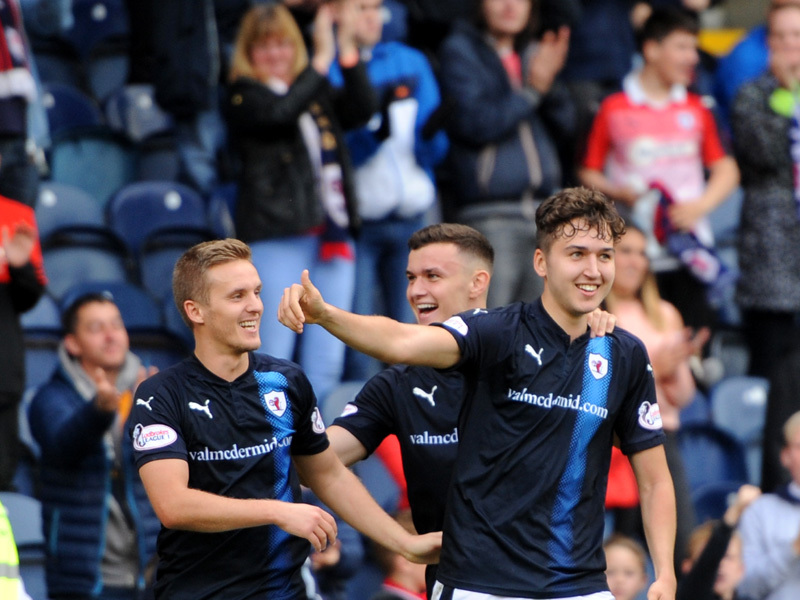 The introduction of Zanatta added a physical dimension to the Raith attack. Relishing a challenge, the substitute immediately engaged Jordan McGregor, Airdrie’s heavyweight centre-half. 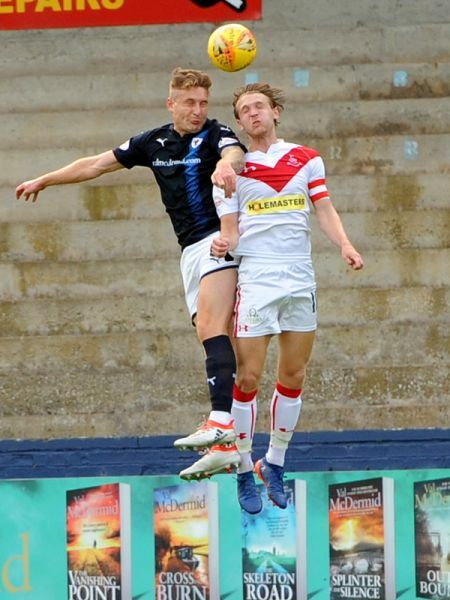 Shoulder-to-shoulder, both grappled regularly – Zanatta booked for simulation following the Airdrie man unwisely sticking out a leg in the penalty area, and McGregor being bamboozled in close contact by a lovely nutmeg. On sixty-seven minutes, Murray’s burst into the box saw Buchanan’s shot blocked clear. Furtado escaped for Airdrie, Smith ushering the Frenchman’s drive into the side netting. 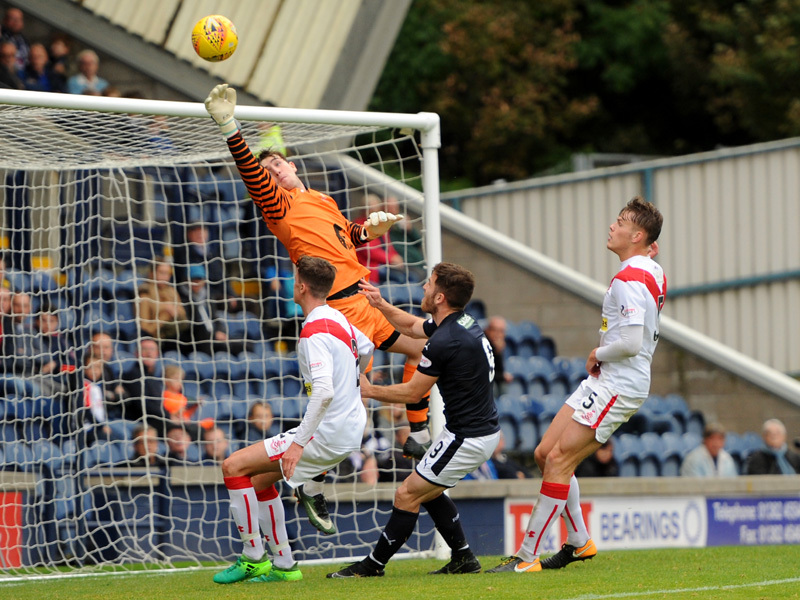 Vaughan’s deflected shot earned yet another corner for Raith, from which the deadlock was broken. With seventy-three minutes on the clock, Vaughan’s high flighted corner hung above Ferguson’s far-post. 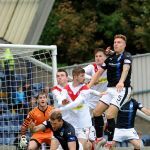 Under pressure, the Airdrie keeper couldn’t gather, and – scoring for the third week in a row – Jason Thomson hooked the ball home. 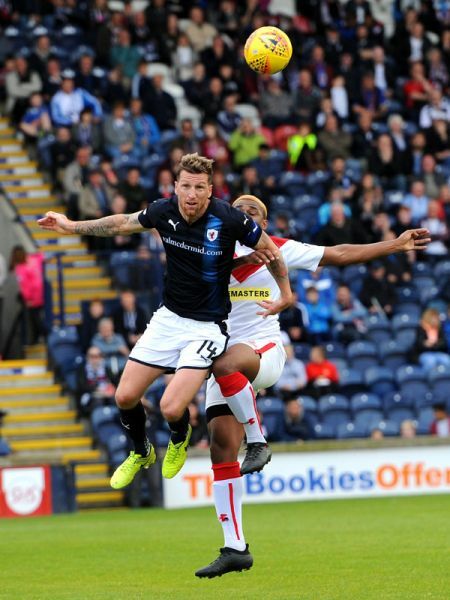 Spurred on by the opener, Raith came again. 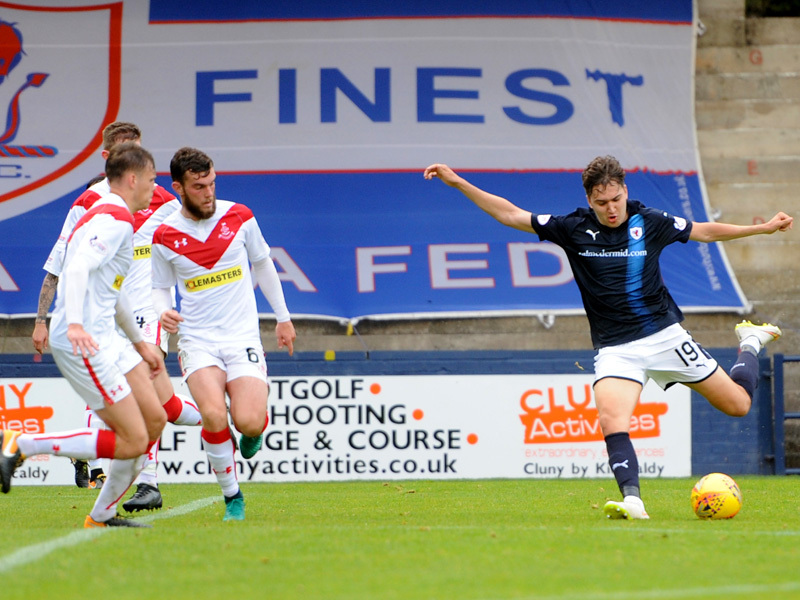 Barr released Vaughan, and following a quickly-taken corner, Raith’s top scorer took aim at Ferguson’s top corner from distance, his shot curling just over. 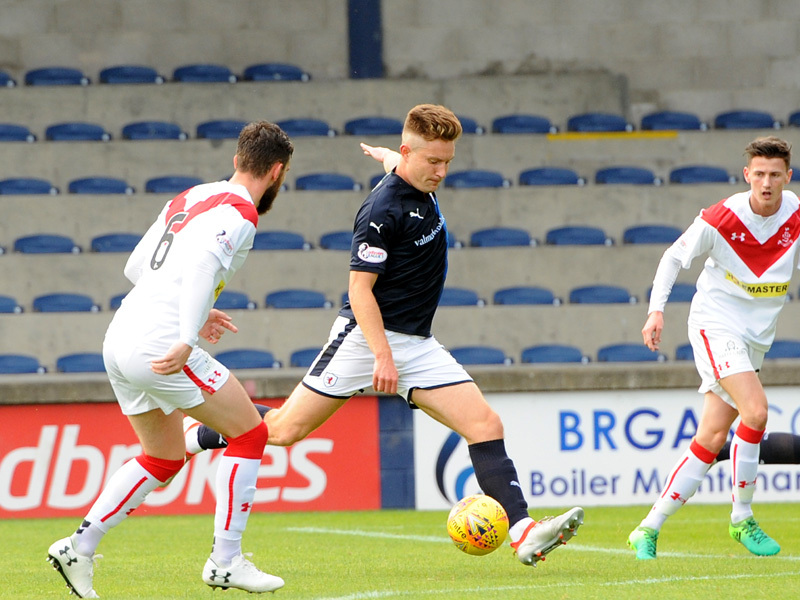 Airdrie re-arranged – Furtado moving wide left, with Russell withdrawn for Jordan Allan, the youngster taking Furtado’s role as the leading marksman. Having survived a bruising from the burly Frenchman, Allan’s high elbow connected with Robertson in their first contest. In front of the South Stand, Vaughan turned and shot well, Ferguson saving low to his left. Thomson’s header struck Ferguson’s bar on eighty-seven minutes. 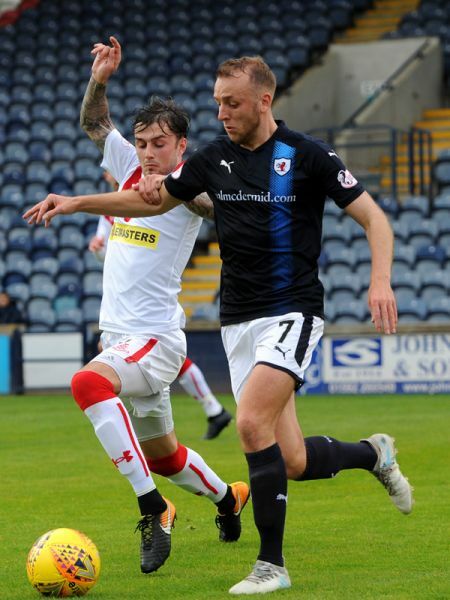 While his scoring run was broken in today’s game, Lewis Vaughan was a hugely important figure for Raith. Originally side-stepped by full-back MacDonald, with the clock showing eight-five minutes, Vaughan chased down the full-back over forty yards, eventually winning a challenge and securing possession for his midfield. Although frustrated in front of goal, his man-of-the-match performance reflected an overall contribution of energy and maturity, which has marked his season to date. 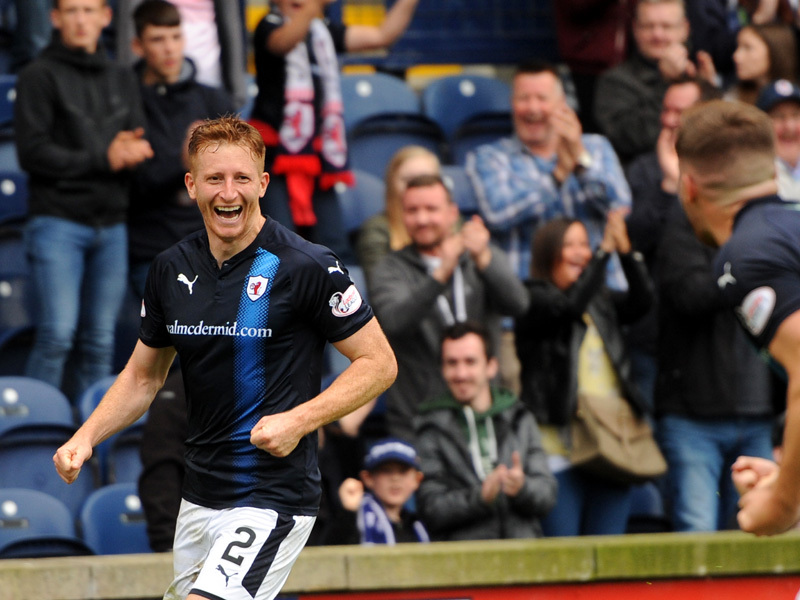 Raith secured the three points in the closing minutes. From a far-side thrown-in, Dario Zanatta bustled his way across the eighteen-yard line. Shrugging off one challenge, the substitute thumped a low drive past Ferguson, taking the plaudits of the South Stand and his team-mates. Welcome to Starks Park, it's 18 degrees and the sun is trying to split the clouds. A poor header by Davidson is pounced upon by Furtado who saw his shot come off the outstretched foot of Smith. The back line are hitting long passes that the forwards can't chase. Spence spills the ball at the edge of the area, Murray runs on to it and thunders the ball straight to Ferguson. At the other end Furtado us denied by Smith. Vaughan lays the ball onto Herron his miss is tempered by the official waving for offside. Robertson couldn't hold off Furtado who hits the side net from a tight angle. Vaughan skelps the crossbar from 15 yards. Furtado again, this time gets round Davidson his shot is parried by Smith. Buchanan across goal to Spence who is denied by Ferguson. First quarter, Raith Rovers 0-0 Airdrieonians. MacDonald hangs his head as his 35 yard cross sails over the bar. Vaughan goes down in the box, Mr Northcroft views this as simulation and administered a yellow card. An Airdrieonians player receiving treatment for a knock. Furtado split the defence but Smith was already sprinting to clear the ball. Buchanan and Barr playing a 1-2 the former sees Ferguson gather his low shot at the near post. Watt, 35 yards out hits his free kick straight into the wall. 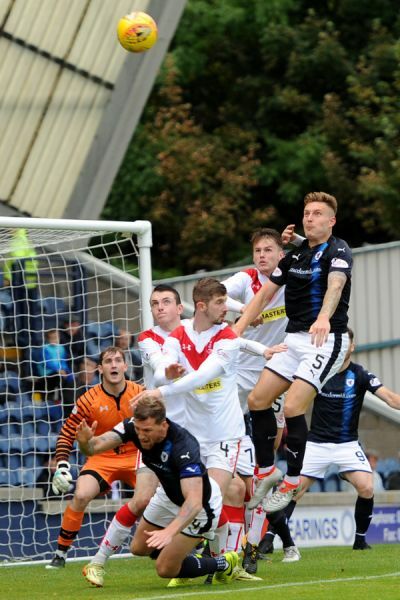 Rovers front players struggling to break through the packed Airdrieonians defence. From a corner, the best the visitors could muster was a 30 yard shot over the bar from Watt. Thomson is lucky to escape without sanction as he downs Russell, from the free kick, Cairns heads over from 18 yards. 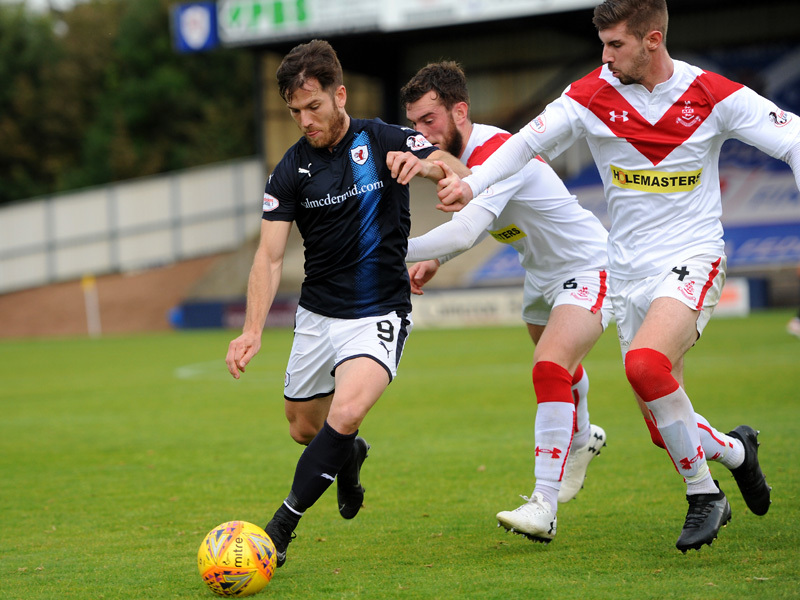 Half time from Starks Park, Raith Rovers 0-0 Airdrieonians. Smith palmed a Furtado shot onto the post. Fry side foots from 20 yards, the ball going wide of the back post. Hopefully Zanatta will inject some pace into the attack. Ferguson at full stretch from a Davo cross. Buchanan and Vaughan through, Vaughan scoops the ball over the bar, but is flagged offside. Zanatta waves his arms to the South Stand looking for encouragement. Murray shoots over from 20 yards. Buchanan hits the side net from a tight angle. McGregor sliding about like Bambi trying to beat Zanatta. The lone Furtado hits the side net from the corner of the 18 yard box. From a corner and with his back to goal Thomson smashed the ball into the net from 8 yards. Jason gets his third goal of the season in consecutive matches. From the corner of the 18 yard box Vaughan sees his shot go inces over the bar. Buchanan and Vaughan 1-2, Lewis turns and shoots from the edge of the box into the arms of Ferguson. Watt speculates with a tame effort from 40 yards. Matthews yellow for a foul. A Vaughan free kick on the right is gathered by Ferguson. Vaughan with a corner, Thomson heads onto the bar. 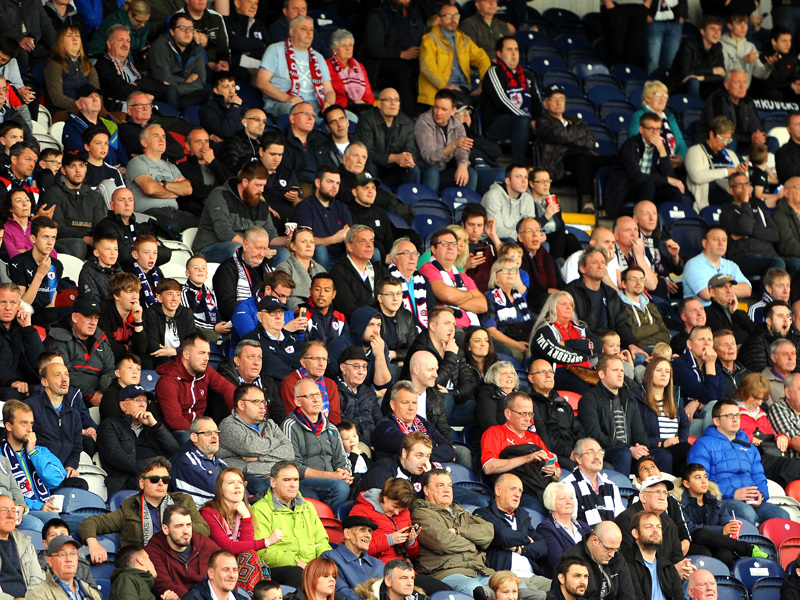 Attendance 1726, 72 travelling supporters. Zanatta takes the ball along the 18 yard line and finds the net with a left footed strike. Smith, Thomson, Herron, Murray, Spence, Robertson, Buchanan, Vaughan, Barr, Matthews, Davidson. Subs Brian, Osei, Court, McKay, Watson, Zanatta, Berry. Ferguson, McIntosh, MacDonald, Brownlie, McGregor, Watt, Cairns, Fry, Furtado, Russell, Stewart. Subs, Kerr, Tierney, Allan, Edwards, Truesdale, Cowie, Thomson. 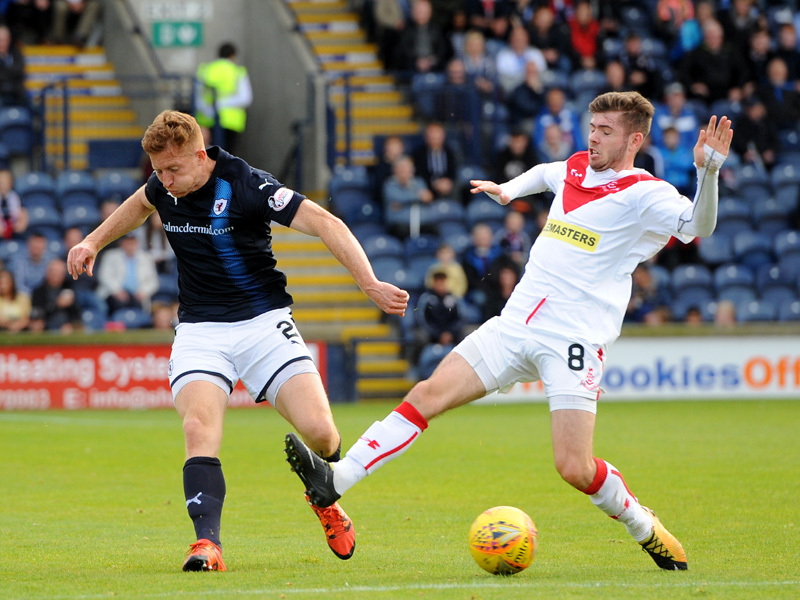 Raith Rovers will be looking for their eighth straight win in all competitions this weekend, while Lewis Vaughan will be hoping to extend his scoring streak to 12 consecutive matches, when Airdrie visit Stark’s Park on Saturday afternoon. After defeats to Stranraer and East Fife in their most recent outings, the Diamonds are residing in eighth place in League One, with the team still without a manager, after Willie Aitchison departed the club last month. The two teams haven’t come face-to-face since the 2012/13 season, although they’d probably had their fill of each other by the end of that campaign, with half-a-dozen meetings over the course of the term. 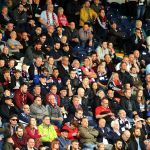 Raith won three and drew one of the four league meetings, while a third round Scottish Cup fixture went to a replay, with Rovers winning a cracker of a tie 4-3 after extra time at Stark’s Park. 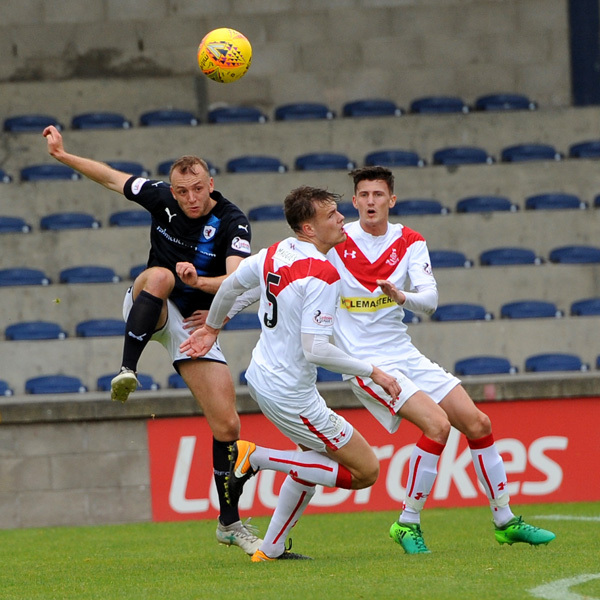 Josh Watt opened the scoring for Airdrie after just three minutes, but Greig Spence equalised almost immediately, before the two sides traded penalties, with Allan Walker converting for Rovers, while Paul Di Giacomo restored parity for the visitors. 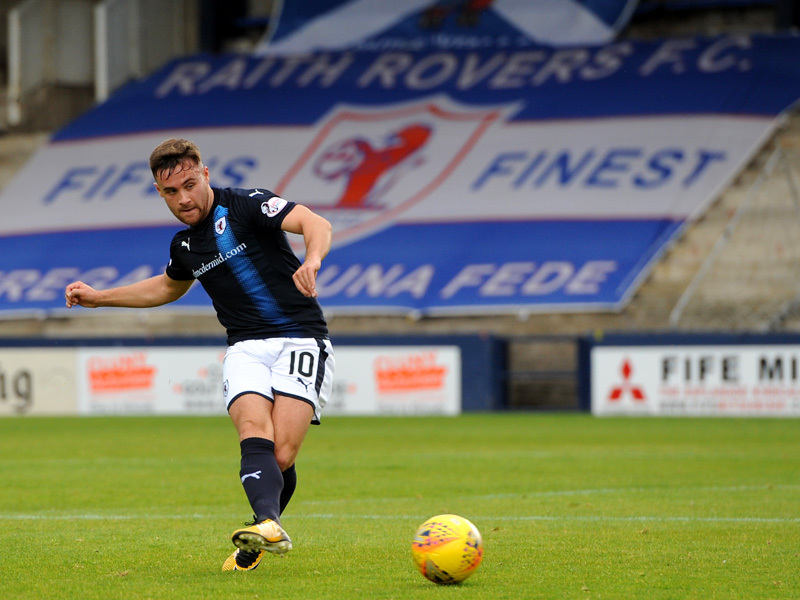 Grant Anderson’s strike appeared to be putting Rovers into the next round, only for Gregor Buchanan to send the match into extra-time with an effort in the 86th minute. However, Dougie Hill’s header just four minutes into the additional half-hour sealed Rovers place in the next round. 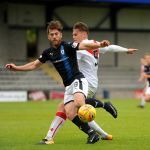 Although Rovers are unbeaten in six consecutive games against Airdrie, the two have a reasonably even recent record, with four wins to Raith and three to Airdrie from the last ten meetings.